Bob looks out at the water in Puerto Libertad. December 1 – 12, 2018. A breeze blows through Ballena Blanca. We look out the side door and see sand and ocean. We fix dinner as the sun sets. We eat inside the van, gazing out, marvelling at the changing colors of the day. Even after it gets dark we leave the door open listening to the sound of the waves crashing on the shore. We fall asleep to the roar of the ocean a mere 50 feet away. Ballena Blanca in her camping spot at Puerto Libertad. Our first stop, Puerto Libertad was a small fishing village. We parked at a spot on the beach near a row of palapas and went for a stroll. 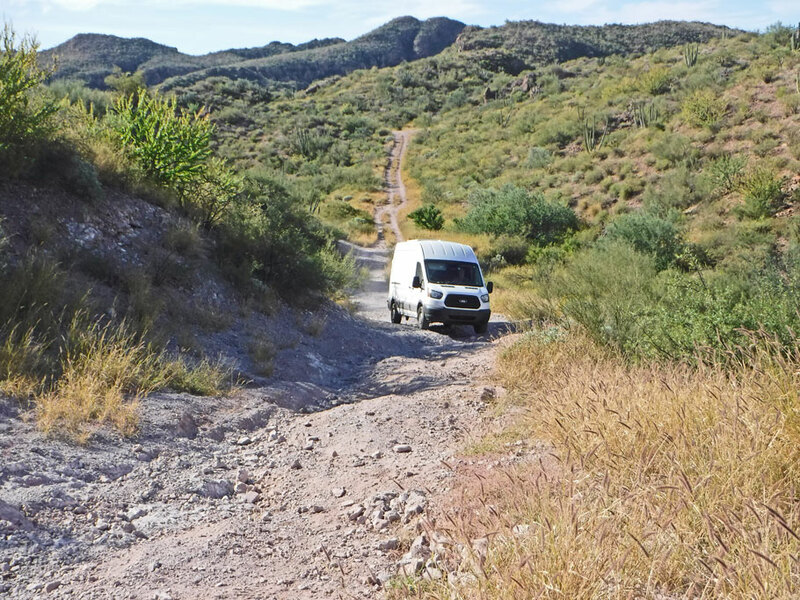 As we ambled back towards the van, a older gentleman called to us and approached with two Tecate beers. Thinking he might be trying to sell them to us I asked, “Se vende?” No the beers weren’t for sale, he just wanted to give them to us as a welcome to his country and town. We took the beers and tried to chat a little in our most basic Spanish. I asked him how he liked the newly elected president, Andrés Manuel Lopez Obrador (AMLO). Our new friend was pleased with him and had great hope for the future. That evening crowds of people gathered with their cars in a lot behind the beach partying and cruising until way past dark. 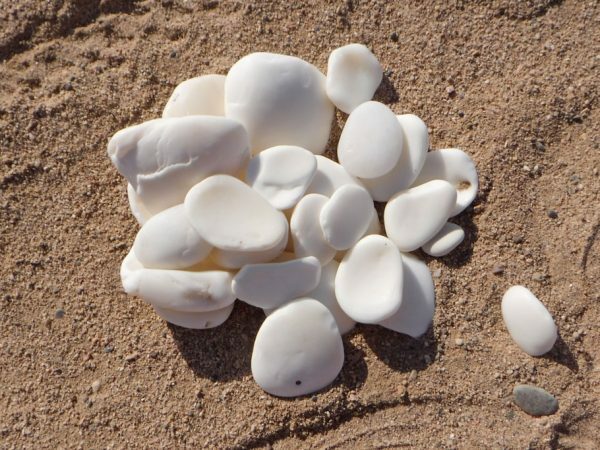 We walked the beach of Puerto Libertad and found these polished oyster shells. I had never seen shells tumbled so smooth like this before. The sun sets on Puerto Libertad. 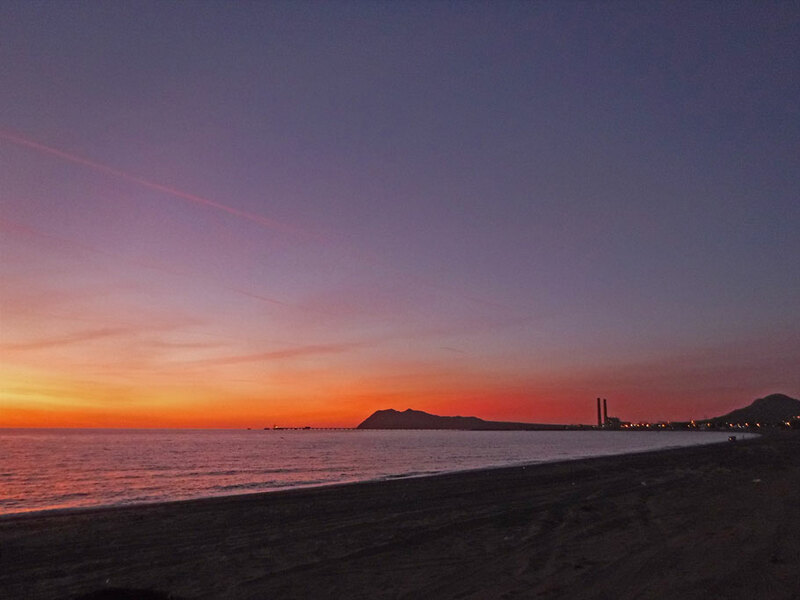 Besides being a fishing village the town is also home to one of the largest thermoelectric plants in Mexico. Our camping spot on the beach of El Himalaya. We hiked up a few hills to some secluded beaches. Of all the beaches we visited El Himalya reminded me most of our beach visits and exploring in the Bahamas. The next two nights were spent at El Himalaya. I had read about this place online. 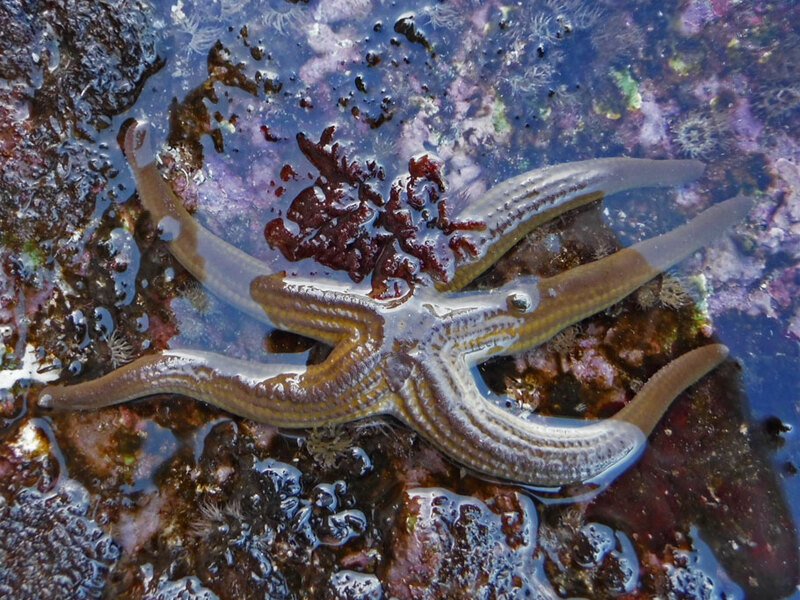 The article, subtitled Closer to Heaven, described it as a remote place of great beauty and a diver’s destination. 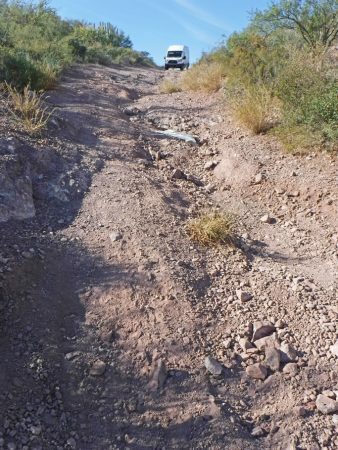 What the article didn’t explain was how incredibly bad the road would be getting there. What was supposed to be a 45 minute drive became 2 hours of nail biting fear. We learned a big lesson here that we would learn a few times over – no matter what Google Maps says, if you see a hand written sign pointing you in a different direction follow it. When we finally arrived Sunday afternoon there were a few Mexican families packing up after a weekend of fishing and heading out. (Something I’ve observed – Mexicans seem to have no fear of bad roads – which may be why we see multiple tire stores in every town we drive through.) But it was beautiful as advertised, ever so quiet, and all ours. There were many abandoned buildings. Some local families were using this building when we arrived Sunday evening as shelter for their tents. On another beach there were structures that looked like they may have been beach house rentals. An abandoned shrine of forgotten dreams. View of Ballena Blanca from another beach. 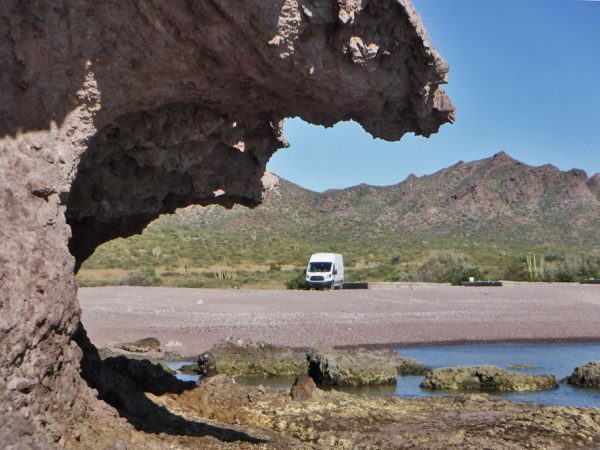 El Himalaya is supposed to be big with divers who drive down from Arizona to see the amazing sea life. On the drive to El Himalaya we choose to follow hand written signs leading us to the beach instead of the route Google Maps had plotted for us. Because the route in was a bit scary we thought we might find an easier way back by following the Google Map route. This was a huge mistake. Ballena sits at the top of a bad stretch of road we encountered on our way back. She made it to the bottom of this hill OK. But then we came to a really bad uphill drive. The map showed us to not be far from where we diverged from this route in the way in so we decided to do a little reconnoitering and walk the road to that point. This was the only bad part so after much strategizing and moving of few big rocks Greg decided to give it a try. Here is where we abandoned our attempt to drive the road after Ballena Blanca’s left front wheel bounced two feet off the ground. We turned around and drove the road we came in on which didn’t seem that scary at all any more. The boring beach at Moroncárit. 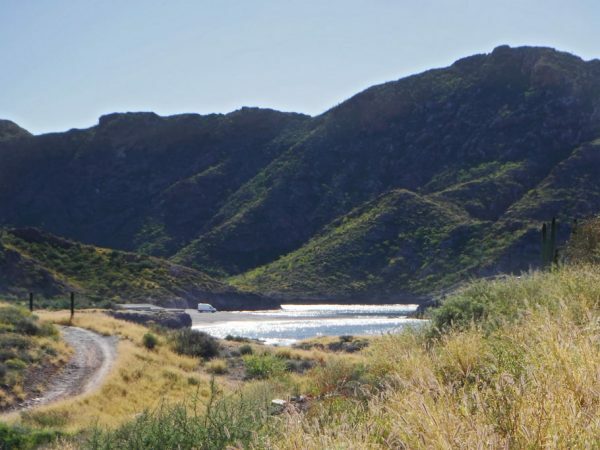 After spending the morning trying to get out of El Himalaya alive, we headed further down the coast to Moroncárit where we found a relatively quiet and amazingly easy spot to get to on the beach. Not much to say here – it was a bit boring, but sometimes boring can be absolutely wonderful. 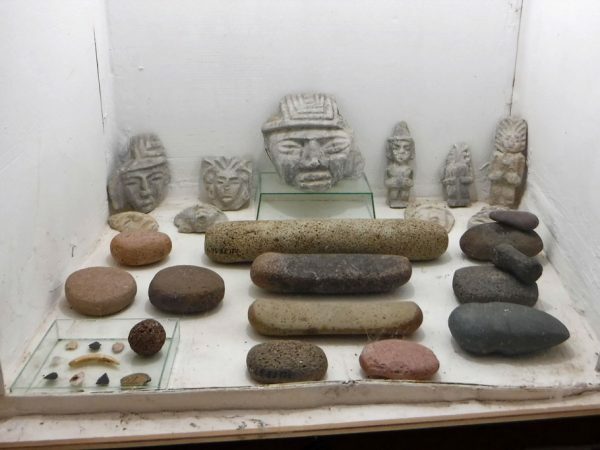 The Hu Tezzo museum realizes a dream of Professor Lombardo Rios Ramirez. Ramirez, now 80 years old, wanted people to experience scenes from within the caves, which are not open to the public. The next morning we headed to the city of Navojoa where we visited at a wonderful little teaching museum called Museo Hu Tezzo. The museum has recreated caves from nine local caverns where prehistoric people have left artifacts, cave paintings and petroglyphs. We took a tour (completely conducted in Spanish) of the installation along with 3 school aged boys. We caught maybe a third, quarter, an eighth, a few words here and there of what she was saying. Despite being a lesson in how much Spanish we don’t know, the tour was fascinating and lots of fun. At the end there was quiz. Greg put the school boys to shame being able to answer a good deal of the questions. He has painstakingly recreated the pintographs and 3D features left by pre-Hispanic peoples. 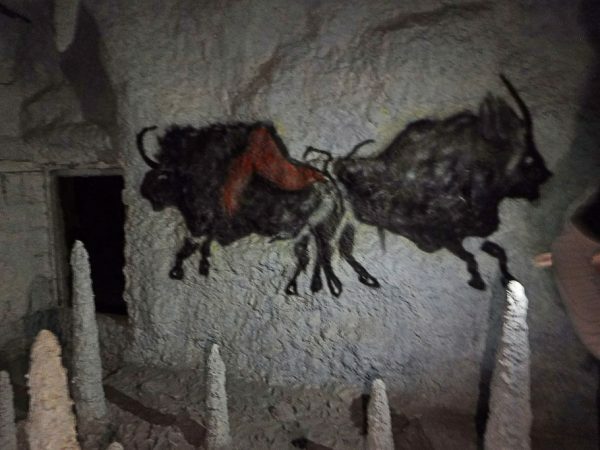 Paited bison from within one of the caves. Our young guide, or guia, led us through narrow passages and around stalagmites and stalactites. It helped to have a cell phone light handy. Here in the museum’s courtyard an awning was put up for the Dia Del Muertos celebration. It’s customary to top these awnings with unique combinations of things loved by the person being remembered. 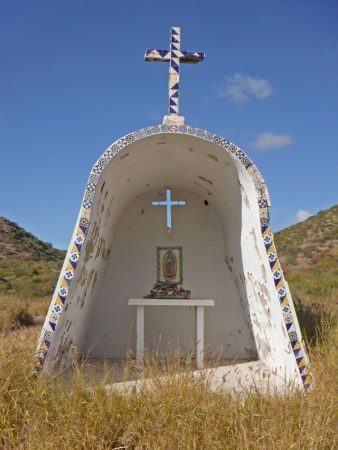 From Navojoa we headed to Topolobampo, a small island located outside of Los Mochis. Topolobampo is lined with bars and restaurants and has nice public areas to hang out and for children to play in. We camped in a huge parking lot right on the water. As the sun lowered on the horizon cars pulled in on either side of us lining up for the night’s party, blasting Mexican rap music until maybe 3 in the morning. 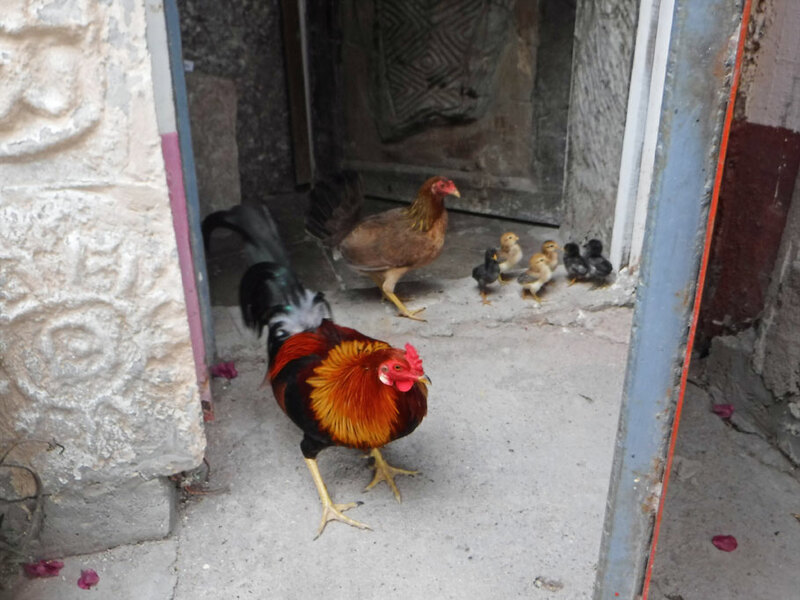 The next day we met one of the island’s tourist police. Hector was great. He grew in California until he was 13 so his English was very good. He has lived in Mexico for the past 12 years and although he still has family in California he has no desire to go back. He wants to visit Canada. He appreciated having someone to practice his English with and we appreciated having our first long conversation in English with someone other than ourselves since we had been in Mexico. Later that night after we were settled in watching a ‘sode on the computer we had our second experience with the tourist police. We heard knocking on the van and after scrambling for clothing, Greg opened the van door and asked the local security, “Cual es su problema?” “What is your problem?” I think this surprised them a bit but after much back and forth not really understanding each other Greg finally told them that we had talked to Hector earlier in the day and everything seemed fine after that. Once we closed the door Greg and I discussed what we might say the next time the police knock on the van door – “En que puedo sevirle?” – “How can I help you?” was what we settled on. One positive thing – it rained that night which put a damper on most of the late night partying. When we first arrived at Topolobampo we explored the northern end of the small island. We saw lots of nesting ospreys and this one have a mid-day meal. 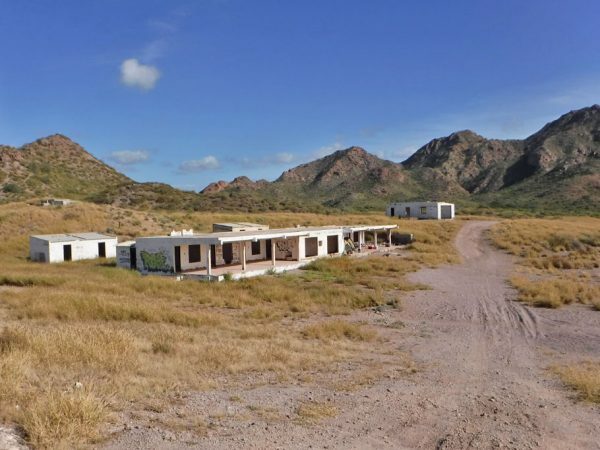 The parking lot and our camping site at Topolobampo. The space on either side of us would fill up in the evening with partiers. And during the day school kids would gather during their lunch hour. The tourist police would come around about 1pm and run the siren to let all the kids know it was time to hit the books again. 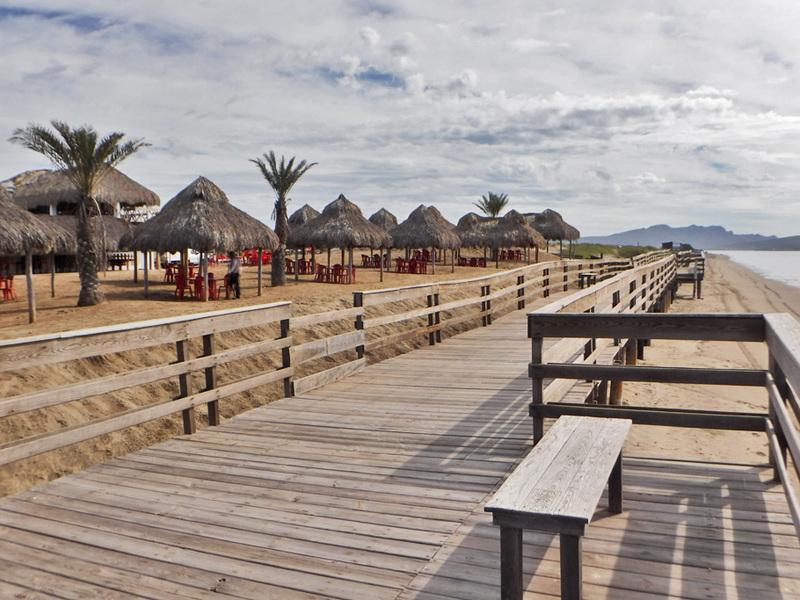 The board walk at Topolobampo was lined with restaurants and bars. We made a small detour from the beach the next day to visit a botanical garden in the city of Culiacán. There was no free beach option for camping here so we went with the only option that was listed on our camping app, iOverlander – a parking lot at the hotel Tres Rios. For $400 pesos – $20 US dollars we got a safe place to park the van and nothing else. The hotel had a loud band but by now we were getting used to sleeping through any type of party. 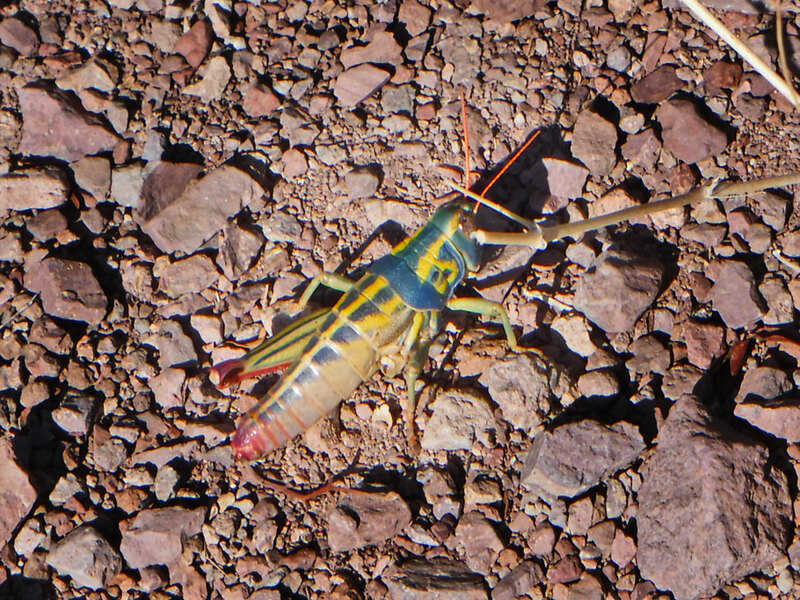 In the morning we went to the Culiacán Botanical Gardens which were wonderful – this will be a post all on its own. The view of the ocean from Villa Celestre. 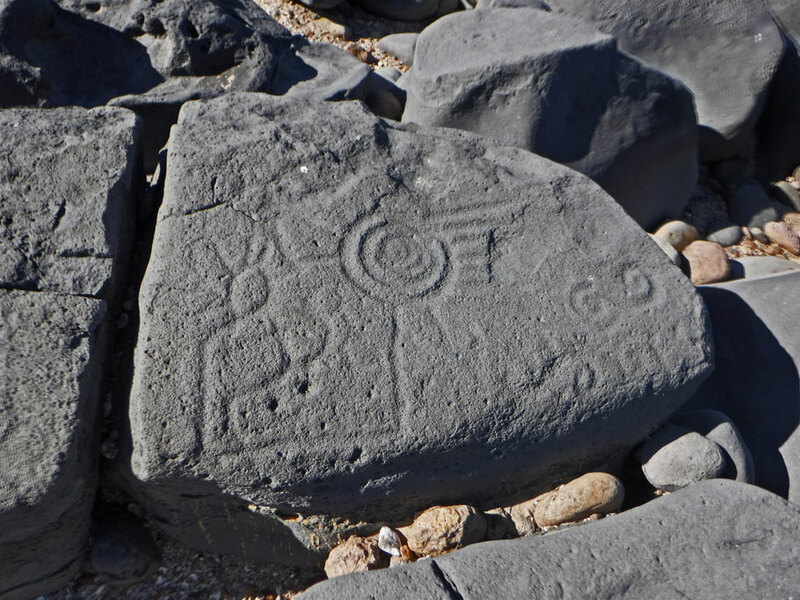 Our plan from Culiacán was to go to Mazatlán but while looking at our route on the map I noticed an interesting site on the way, Las Labradas, where we could see petroglyphs on the beach (who knows how I missed this one making my Mexico map this past summer?). We knew it would be late when we got there but we decided to go on anyways and see if we couldn’t spend the night in their parking lot. The answer was no. So we opened up iOverlander to see what options were available near by. Not far from where we were in the direction we had just come from was some free beach camping. But then I looked at a paid site in the same area. 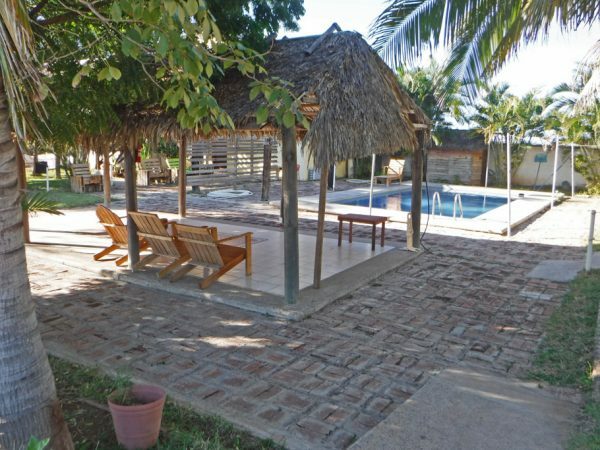 It wasn’t much, $250 pesos (Old info, it ended up being $300 pesos – $15 US dollars), had great reviews, an owner who spoke English, and hot showers. I thought showers might be a good idea after a week and a half on the road. The place was everything as advertised. We met a few travelers and a few people who were staying there over the whole winter season. The owner, Noah, was great. He lived on the property with his family and a few pet dogs. The view was fantastic, and the showers were hot enough. We stayed two nights. Besides having a beautiful view Villa Celestre had bathrooms, showers with hot water, rooms for rent, and this lovely pool. 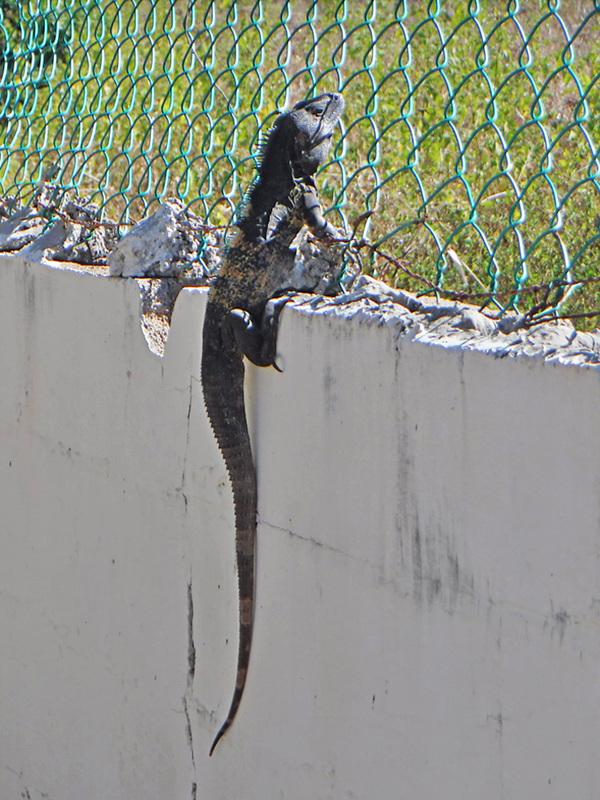 In addition to Noah and his family and all the campers, Villa Celestre is the home to at least a half dozen iguanas that lived in the cinder block wall. This is Pancho, named by Noah’s youngest daughter. Here at Las Labradas we were led by a guide. 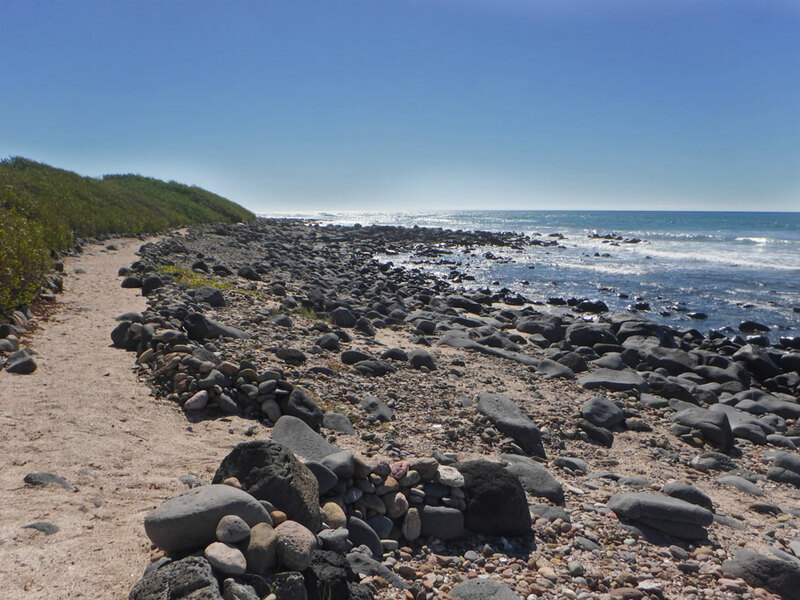 This section of beach is covered with volcanic rock. 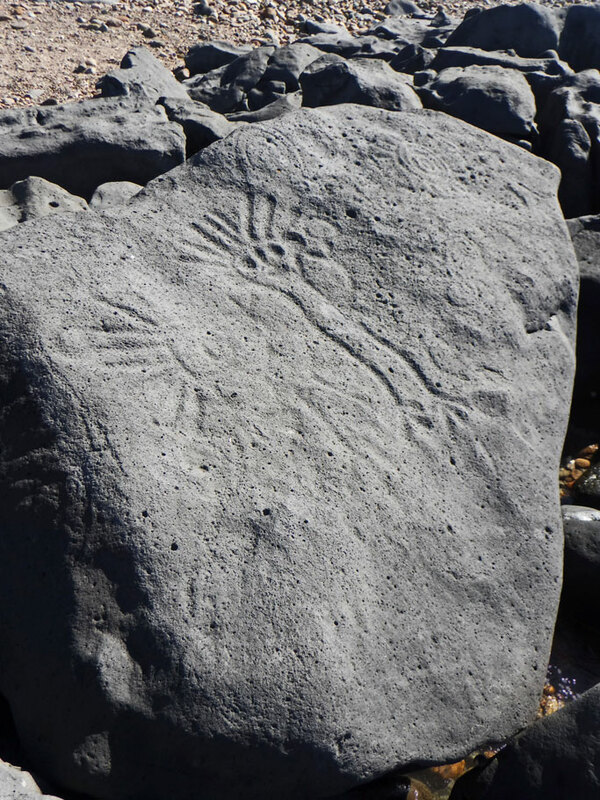 Many of the stones have ancient petroglyphs. Finally we made it to Las Labradas. Las Labradas is run by the INAH (The National Institute of Anthtopology and History). 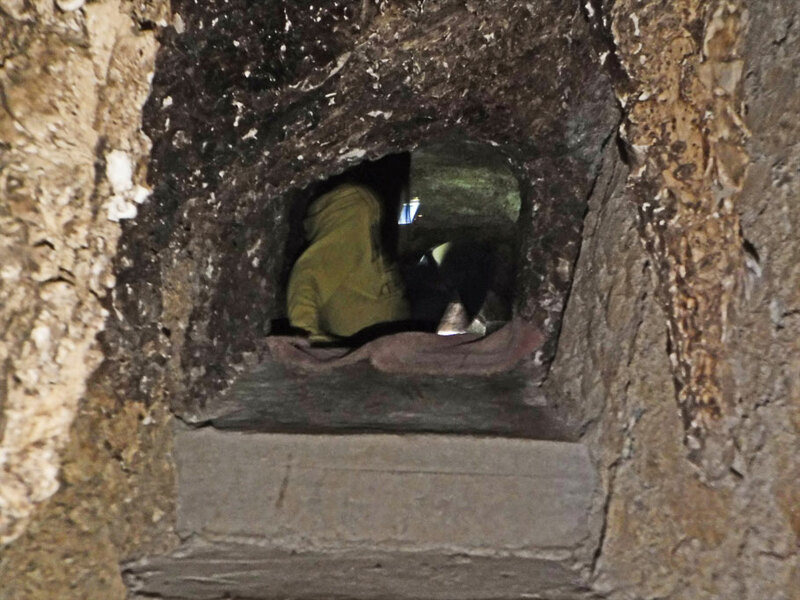 The INAH is possibly the most organized organization in Mexico (we will be visiting many INAH sites). We have seen lots of petroglyphs, but never on the beach. I find it amazing that they haven’t all eroded away. From Las Labradas we made our way down to Mazatlán. 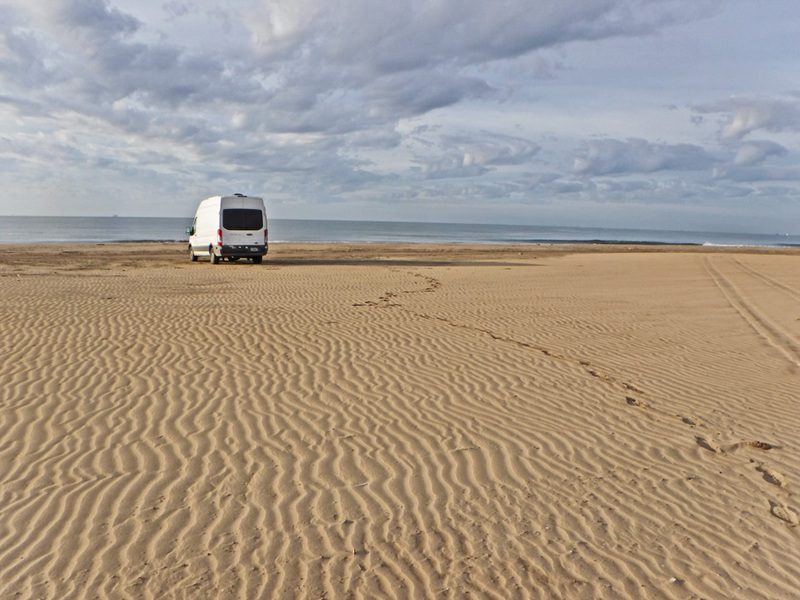 We used iOverlander again to find a spot on the beach. We drove down a dirt road lined with big houses and condos, then turned off onto a bit of rough short dirt road and found a spot on a small hill just big enough for one or two vehicles with a very nice view of the ocean. 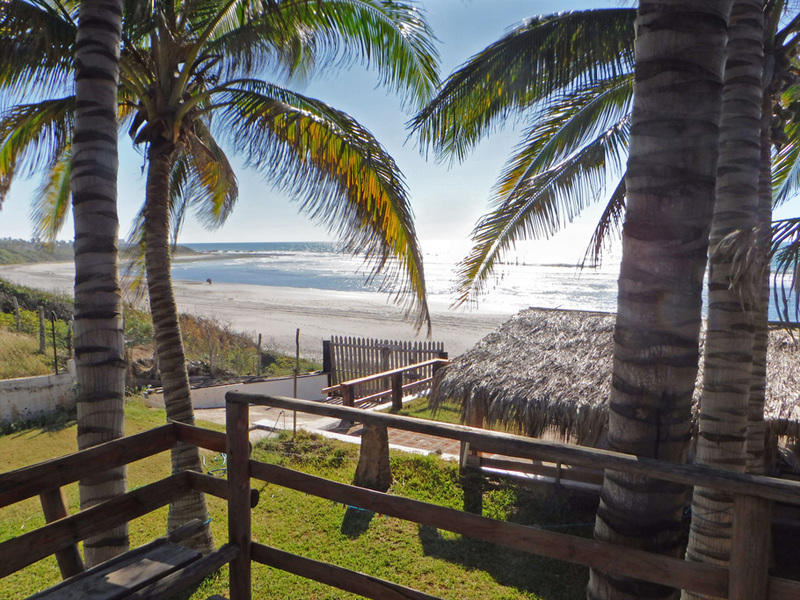 We went into Mazatlán the next day and came back to the same beach spot for the night. Mazatlán deserves it own post so I’m not going to tell you much else about our experience there except to give you this teaser – That second night on the beach in Mazatlán was the second time we had the cops knock on our van. The outcome was a bit different than the first time. 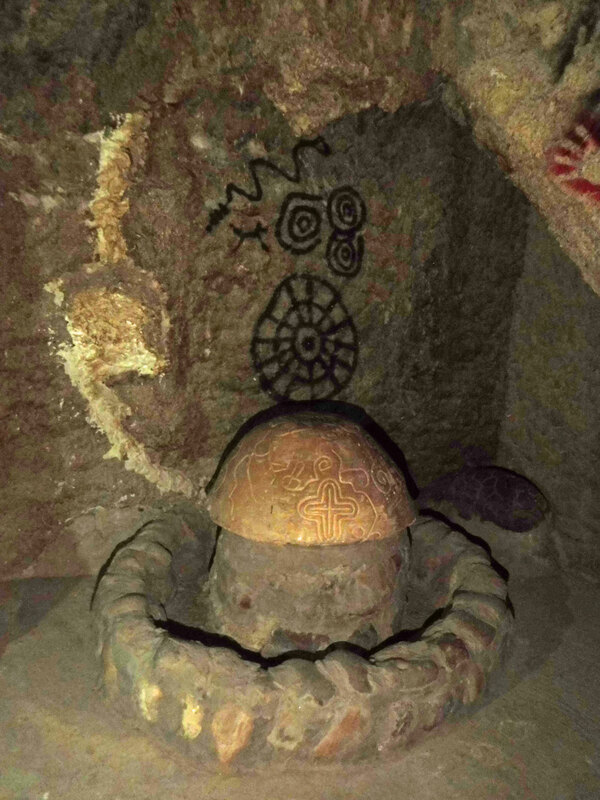 Most of the glyphs are depictions of animals, some are animal features on rocks that have that animals’ shapes. This one is thought to be a solar eclipse or possibly a comet. 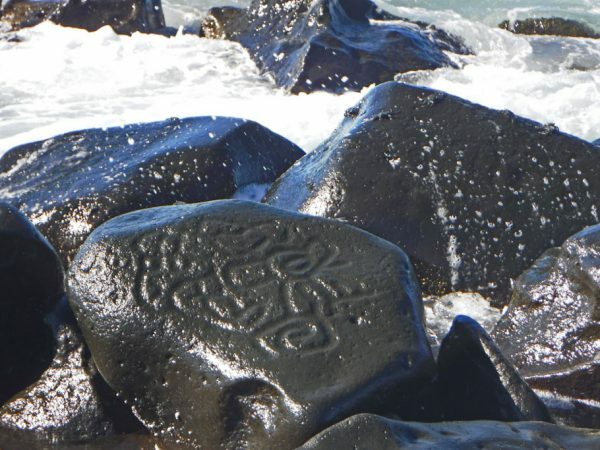 At high tide many of the glyphs are hit by waves. Crabs and snails crawl over designs like this. 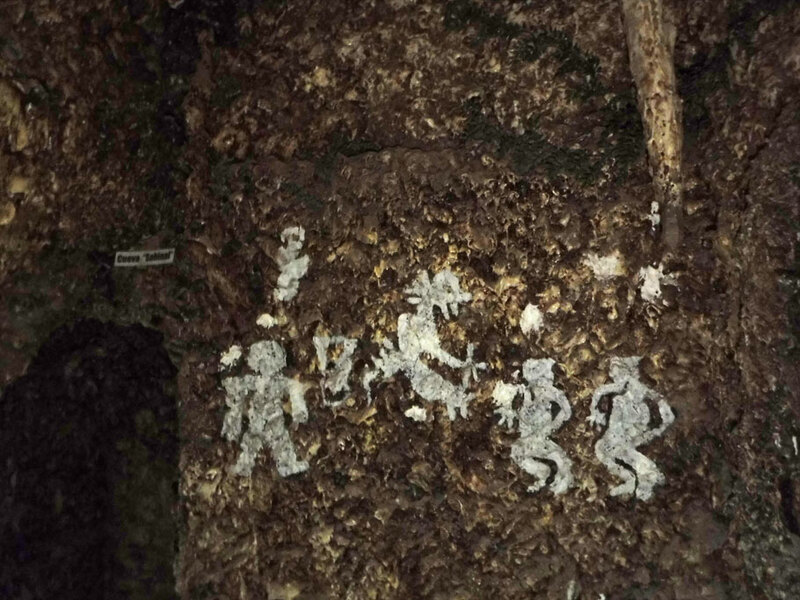 Some of the glyphs depict humans with exaggerated features. With the loud surf we had some trouble understanding the spanish names of animals and body parts. Our guide was very patient, though, and happy whenever she got through to us. 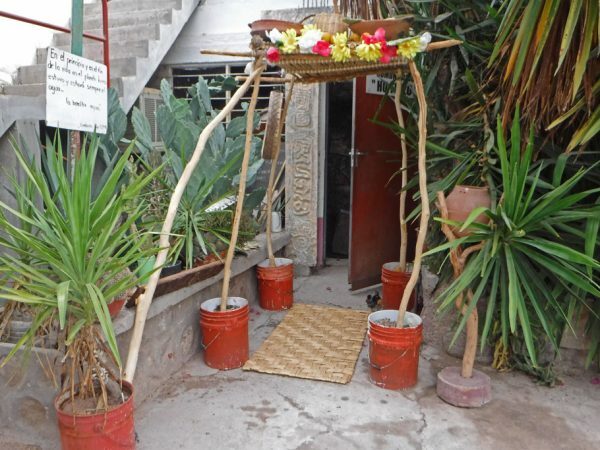 Our spot behind the restrooms at Restaurante La Tambora. After our experience in Mazatlán we wanted a more legit place to spend the night. 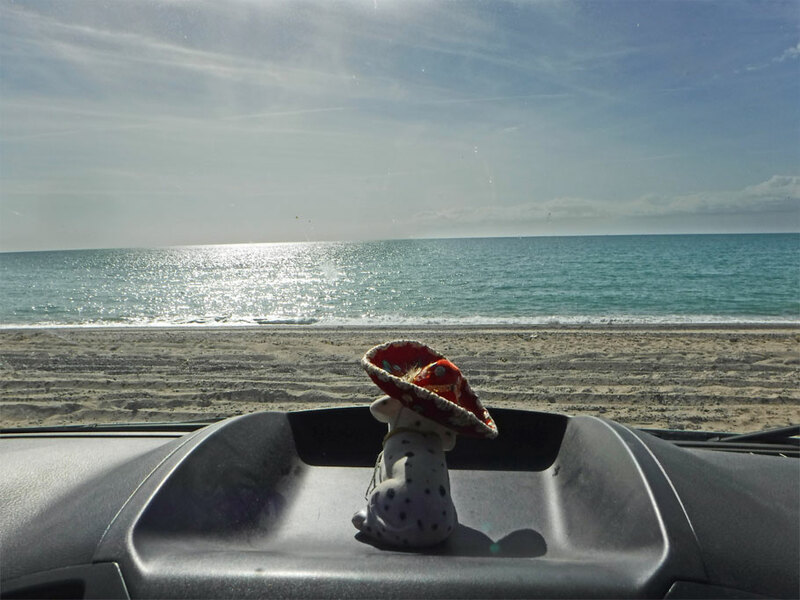 We continued south and found our last beach spot before we would turn towards the interior of Mexico. 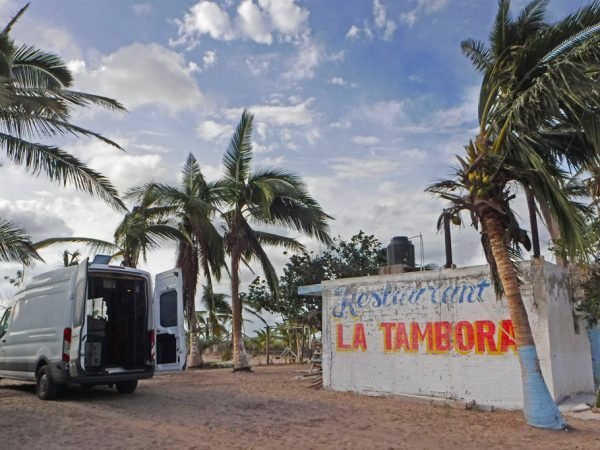 At Restaurant La Tambora we paid $100 pesos to park the van behind some restrooms. The owner was super nice though and spoke to us in slow Spanish before she locked up and went home that night. She told us that a guy would be on the grounds overnight and that another guy stayed at the building under construction next door. Our overnight guy at the restaurant came by too and made sure we knew he was there and that he would leave the light to the bathrooms on for us. We had once last Mexican sunset over the water and then bright and early the next morning we were gone and off to higher ground. Greg entertained the owner of La Tambora and her friends with a Spanish language tune on the accordion. They seemed to enjoy it. 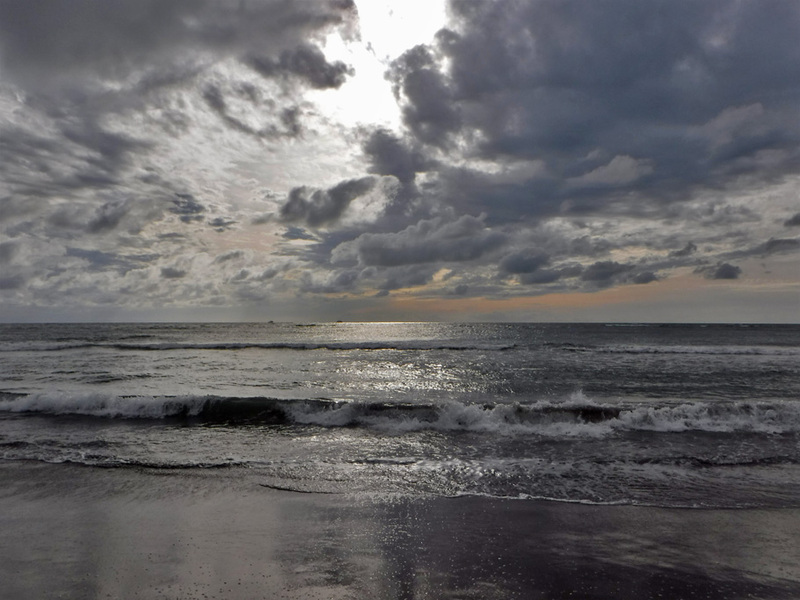 At La Tambora we say goodnight to the beach for a while. This entry was posted in Mexico, Sinaloa, Sonora, Travel On The Dirt and tagged Beaches, Las Playas, Mexico, Mexico Beaches, Mexico Road Trip, Petroglyphs, Sinaloa, Sonora. Bookmark the permalink. Awesome post! Ive never heard of most of these places, so now we will have to ccheck them out. I love following (and being part ofJ your adventures. Thanks Jules! So glad we got to be a part of each other’s adventures these past few days. There is so much to see and do in Mexico! Good way to improve your Spanish! Keep on having fun. Thanks John! We learn a little bit more about Spanish all the time. 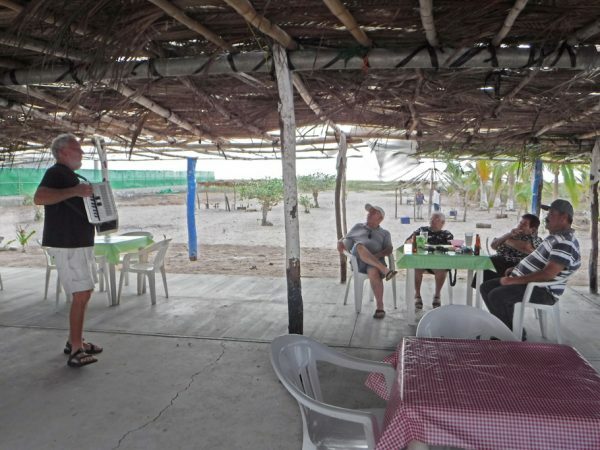 Hi DuWan, I curled up with my coffee this morning and travelled with you and Greg down the coast of Mexico. What a lovely time we had! DuWan, you write beautifully and bring all of us to places we will probably never actually see, but feel like we have! Sounds like your trip is going great. Can’t wait to hear more about Las Labradas and Matzatlan. I am so pleased you are following along and enjoying our adventures. We are in Mexico City at an Airbnb so hopefully we will have some time to get those other posts out this coming week. PS I meant to say I wanted to hear more about the Culiacán Botanical Garden, loved what you showed of Las Labradas! The adventure continues! It sounds like you’ve mostly had good luck and good experiences using iOverlander in Mexico, which is nice to hear. But, once in a while there seems to be a cop involved. Par for the course in Mexico? I remember staying at restaurants in Mexico and Central America as well where vigilantes provide security. It’s always nice if your little fee covers restrooms and showers. Your beach camping spots look fabulous! The only times we heard crashing waves on our boat, was from the protecting reefs. 🙂 I do like the sound. Yes, everything is good so far. I’m not sure how I would feel about vigilantes providing security – but I guess if they are good with us it is way better than cops knocking on your rig in the middle of the night. We never had the experience of anchoring in the Lee of a reef. When ever we heard unless we were in an unprotected anchorage and a front was coming through – unfortunately that happened to us too many times. Paying for a place with good showers can be soooo worth it after traveling for a long period of time! I remember getting stressed in Scamper from time to time not knowing if we could find a place to camp for the night. 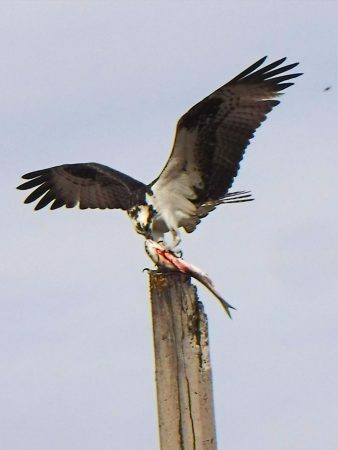 You seem to be doing pretty well overall finding decent spots. I see more showers in my future. Finding free places to camp has been so easy for me in the US but not so much here in Mexico. I think we will be paying (Boo) for more official places to camp meaning possibly more showers (almost always Yay). Not knowing where you are going to park at night is really stressful.